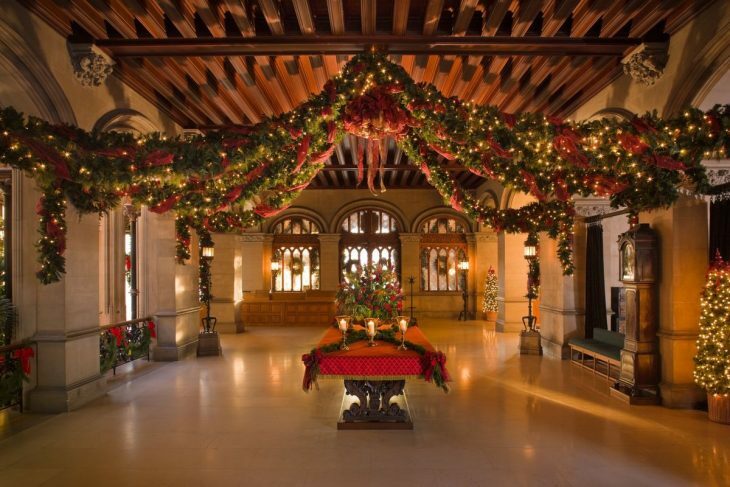 There are few large estates that portray the magic of Christmas like theBiltmore House, with 250 rooms, America’s largest home. I have no hesitation in sharing that this is my favorite historical house in all of America. When I moved to North Carolina it was the first tourist trip we made, and from that day forward it captured my imagination. I soon purchased a season ticket, and did so for many years, visiting it many times over with friends who came to visit us, as well as when working in the area, or going just alone for the chance of learning and letting more details about the home percolate in my head. This is a historic home that somehow resonated with me like no other. 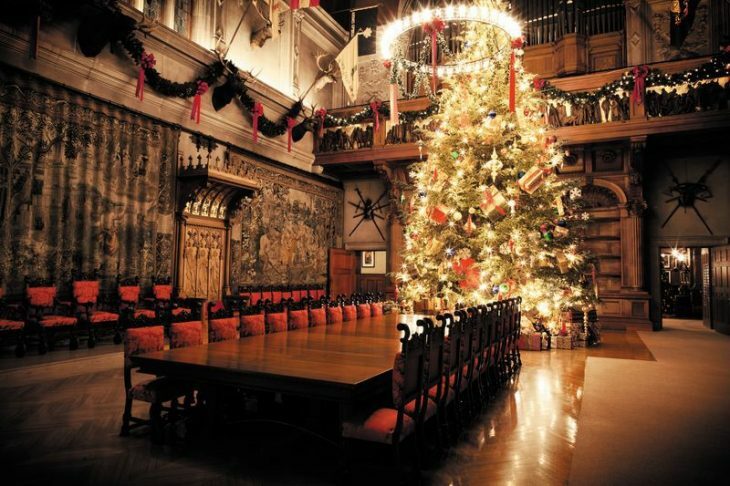 As I moved through each room, I could almost hear echoes of long ago inhabitants swaying to music, or moving from the dining room to the library, perhaps sitting in deeply cushioned sofas to enjoy an after dinner drink or to read a book. 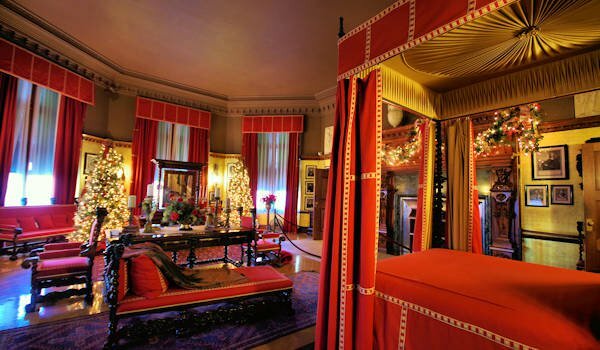 History comes alive for me when I visit this grand house. My visits stoked my curiosity to learn more about it’s architecture, art, landscape, design decisions, the people, the times. 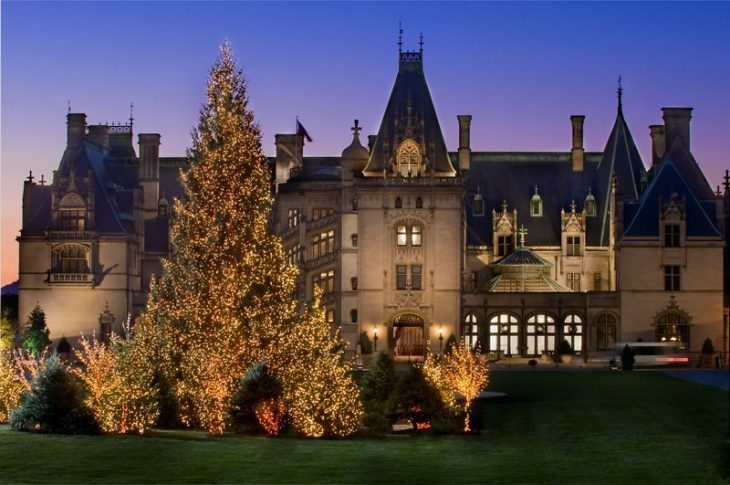 So today I thought, as Christmas approaches, I would share some of the holiday spirit that embraces the Biltmore in Asheville, NC. Down the road, I would like to do a post on the history of this estate as it is not only interesting, but there were many “ahead of their time” decisions that went into building this estate. It is fascinating, intriguing, and I think you would find it enjoyable. But for now, I hope this post moves you further into the Christmas spirit. 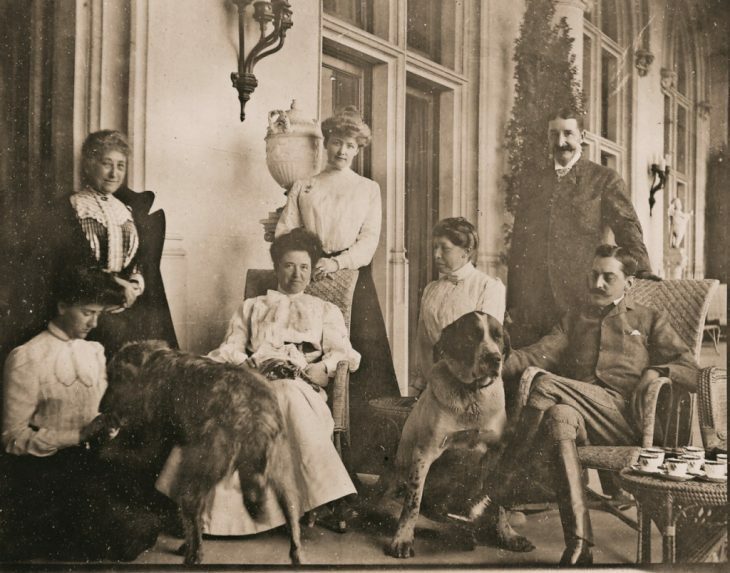 Here is a photo of the Vanderbilts on a terrace with their St. Bernard and an Irish Wolfhound. I love that he is petting his dog. 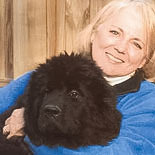 Perhaps that is one reason that I was attracted to the people and the history of this storied house is because of the giant breeds, as these in particular are so wonderful with children, and there were always children around the estate. I wanted to start with a photo of the original inhabitants of the home so you might begin to get a feel for it. 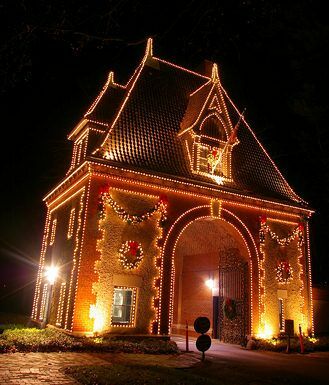 Here is the gatehouse entrance to the estate, readied for the holiday. I want to show you a photo of the front during the other seasons so you can appreciate the effort to transform this house for the holidays. Here is a photo of the back of the house, which allows you to see the formal gardens to the right. Also in the same direction is the gorgeous glass conservatory and flower gardens. 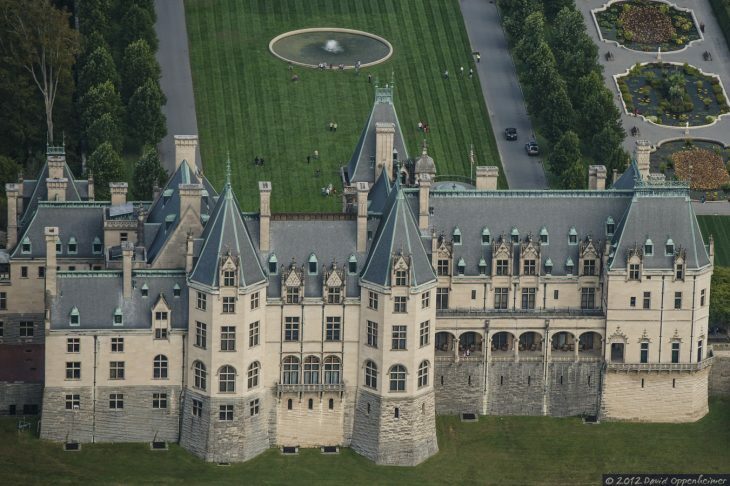 Biltmore Estate – aerial photo of the Biltmore House taken on October 6, 2012 – © 2012 David Oppenheimer – Performance Impressions Photography Archives. Here is how the front is transformed for the holidays. Around the water feature are trees brought in just for the holiday. The largest of the outdoor tree is a Norway spruce, and it is surrounded by 20 other evergreens. 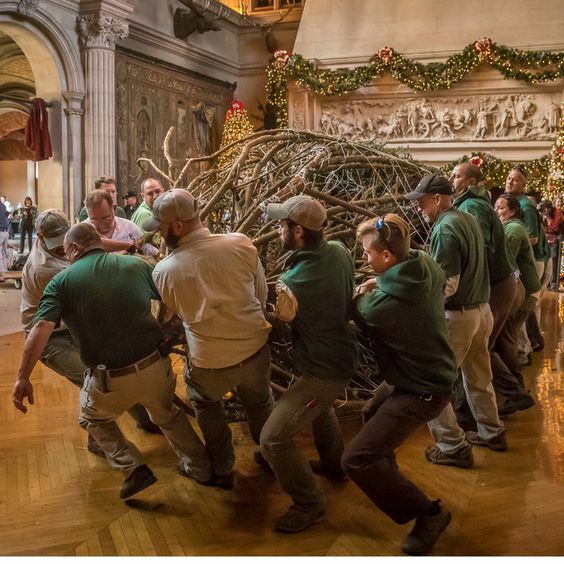 When it is time for the traditional 35 foot tall Frasier fir to arrive, it is with a bit of pageantry. 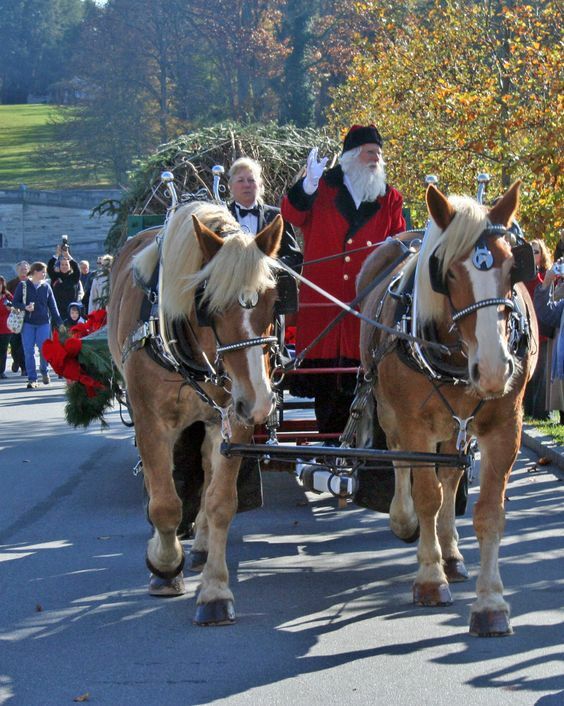 Santa leads the horse drawn wagon up the drive to the front entrance. I wished they would braid and weave Christmas ribbons in the horses mains and place some bells on their harnesses. It takes a huge effort for them to pull that tree and they deserve some fancying up and a peppermint treat at the end of their task! It’s a pretty big deal and it takes a lot of work to make it happen. 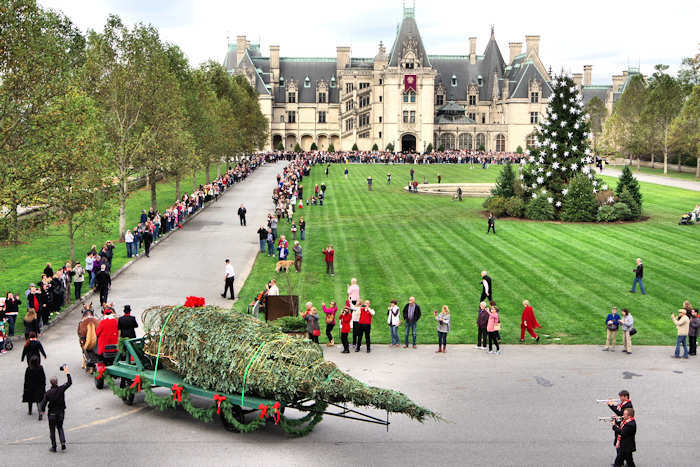 About 50,000 lights are on the front lawn tree, and 20,000 on the trees and shrubs. So here we are at the main entrance to the house. 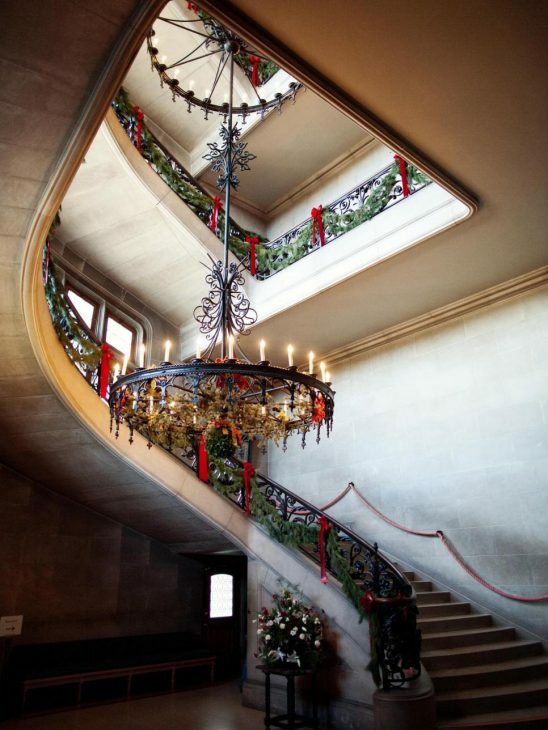 They place 360 wreathes around the estate. It takes about 50 employees to move this tree into the banquet hall. It is all done by hand rather than lifted into place by machinery because of the risk of possible damage involved to the floors, the magnificent chandeliers above and the tapestries on the walls. 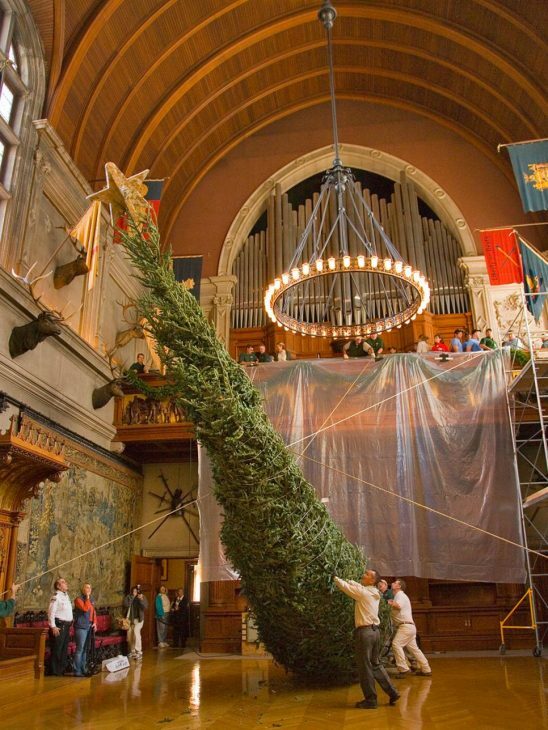 Here you can see the rigging that is set up to raise the tree. Quite elaborate! Wonder what the deer and elk heads are thinking? Notice the pipe organ on the balcony above and the barrel vault ceiling. 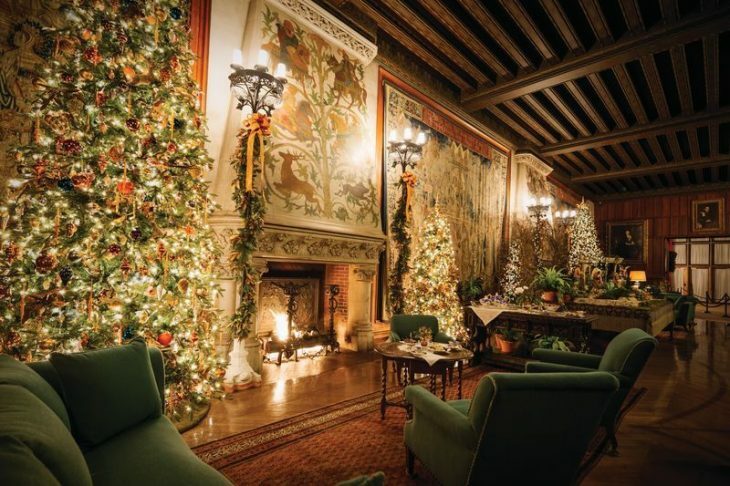 They use about 30,000 lights and 150 candles inside the house and more than 350,000 LED and mini lights around the estate. Each and every light is checked. 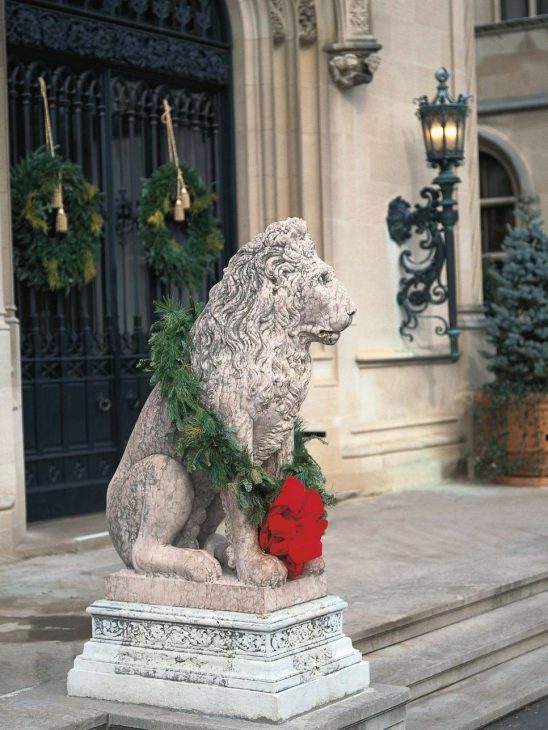 OK, let’s begin the tour to see the results of all this year long effort by starting back at the front entrance where the two lion statues greet you. At dusk they light 250 luminaries along the driveway and the Esplanade, some of which you can see here. 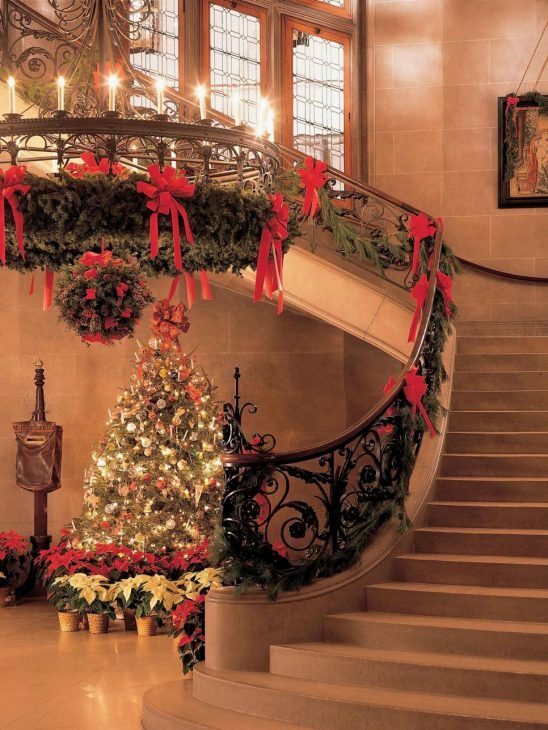 When you enter the house, directly to the left is the grand staircase lined with garland. 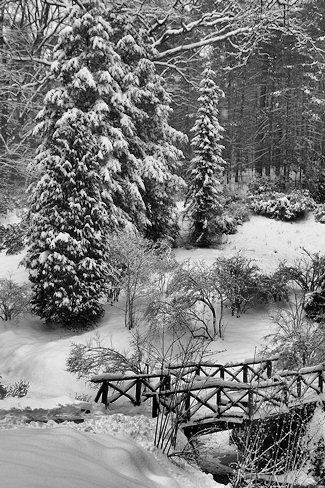 As you enter the house, to the right is what is referred to as the Winter Garden. Here it is adorned with tropicals at a wedding. This is how it is usually decorated off season. 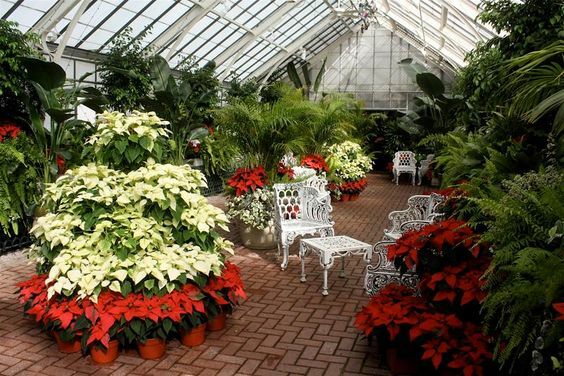 For the holiday they add garlands and around 100 poinsettias in addition to Christmas cactus, peace lilies, orchids, cyclamen, begonias, kalanchoe and about 1000 amaryllis. 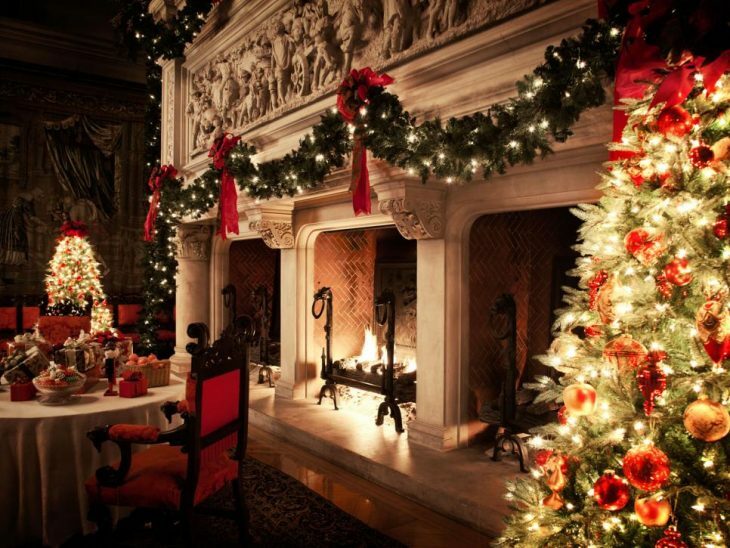 During the candlelight tours they have musicians and vocal groups throughout, and it enables visitors to feel like they have stepped back in time to the first Christmas celebrated in the house way back in 1895. Behind the stairs is a long corridor called Tapestry Hall. Here is another view looking back from the only room connected to it, on the far left side of the house, the library. 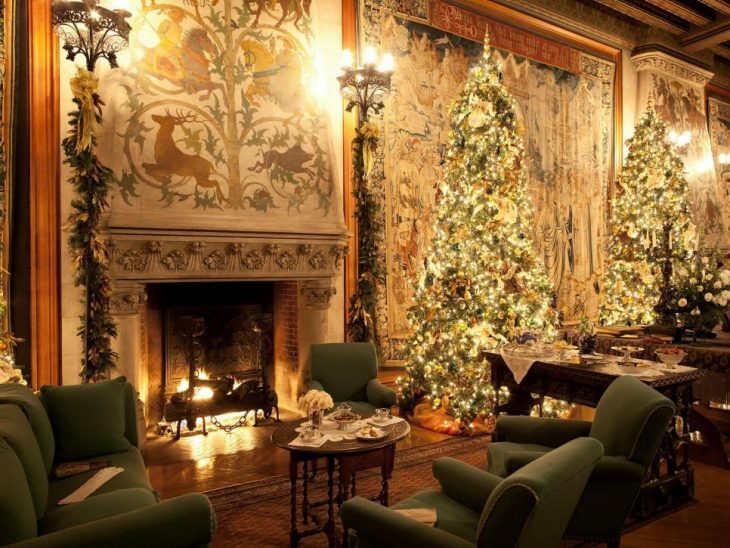 Here you can see the tapestries along the wall and the gorgeous trees. You can begin to see why it feels so magical here. 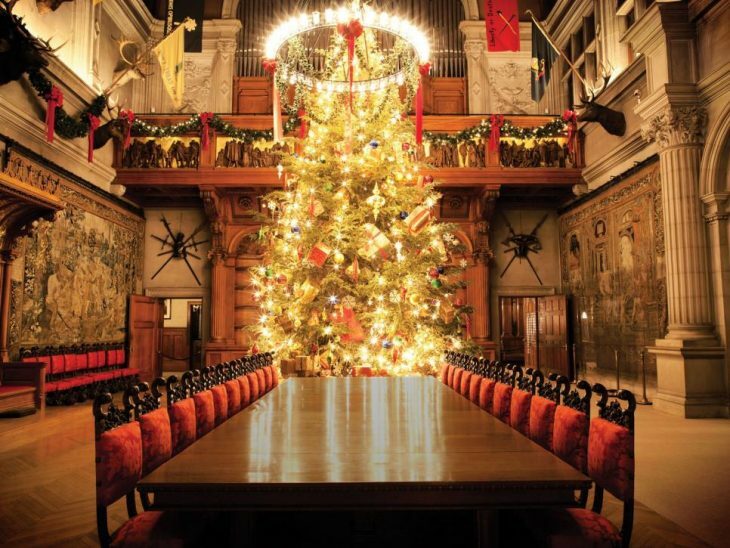 There are 55 decorated trees inside this year. 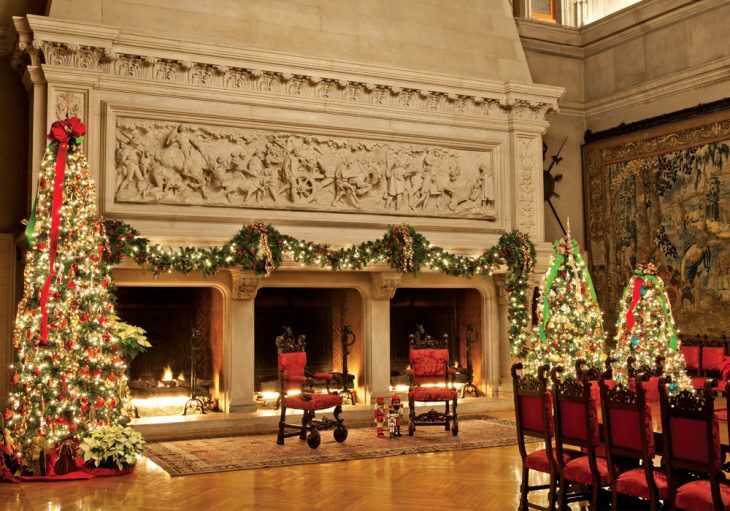 A total of 35 more are decorated at other estate locations like the winery (established in 1985), the Hotel and the restaurants. 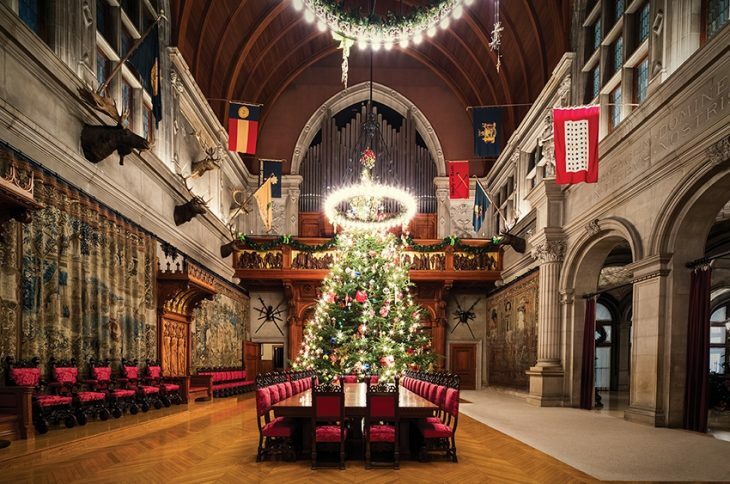 Can you just imagine what it must have been like, guests seated, enjoying food and fine wine, and perhaps holiday music playing from musicians, or coming from the organ? If I remember correctly, the acoustics in this room are near perfect. 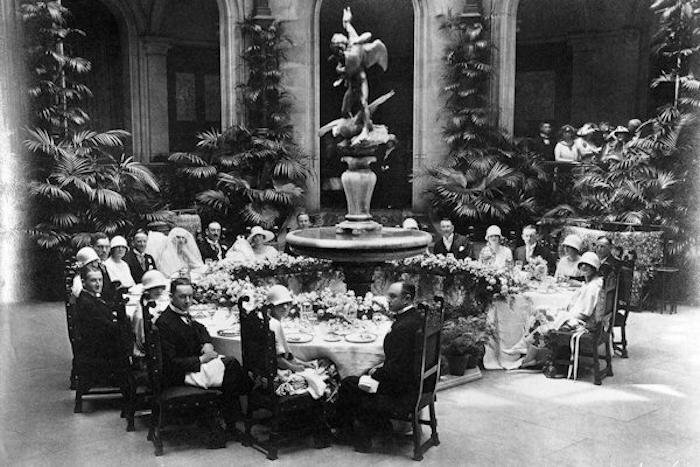 The person seated at the head of the table can hear the person at the opposite end. There are three fireplaces, and they can heat the entire room. They are at the opposite end of the tree, and the balcony with the organ. The tapestries throughout the house are exquisite in person. 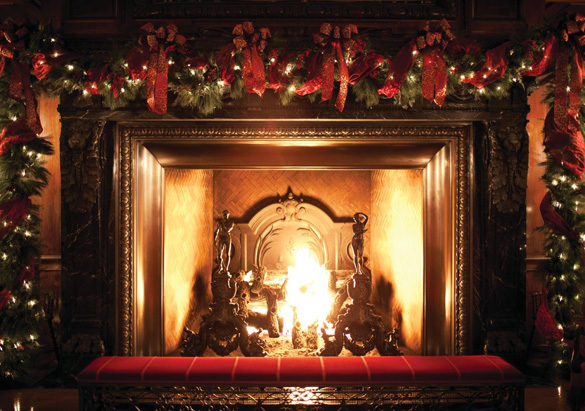 Here we can see the three fireplace openings from afar. 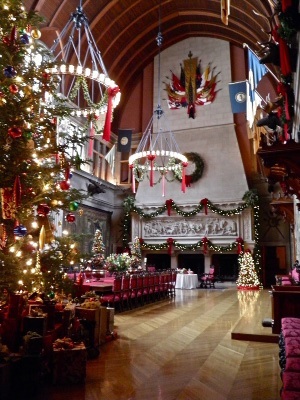 In the banquet room they use 500 ornaments and 500 gift boxes to adorn the tree. It is lit with 500 LED Edison style bulbs. A closeup of the frieze. 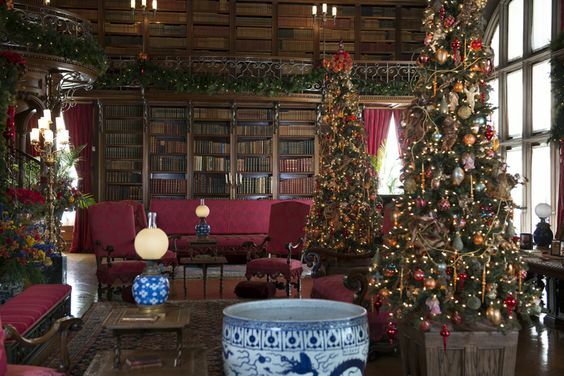 Here is my favorite room in the house, the library. Dare I call this room cozy? 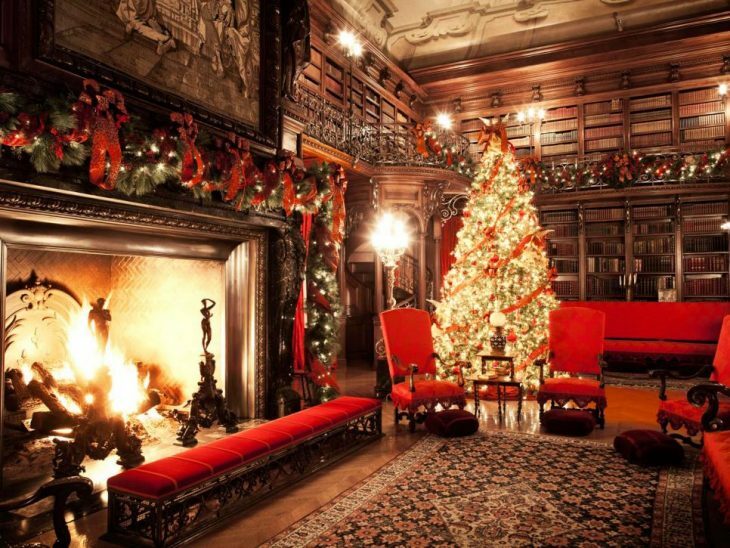 This is heaven to me, wood paneled walls, more books than I can count, and a glowing Christmas tree and a fire. 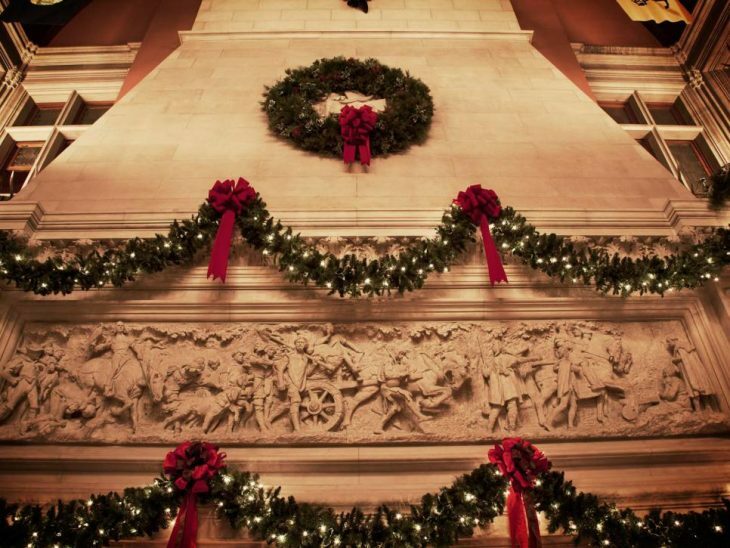 A closeup of the decorated mantel in the library. The garland is beautiful with all the bows. Speaking of bows. 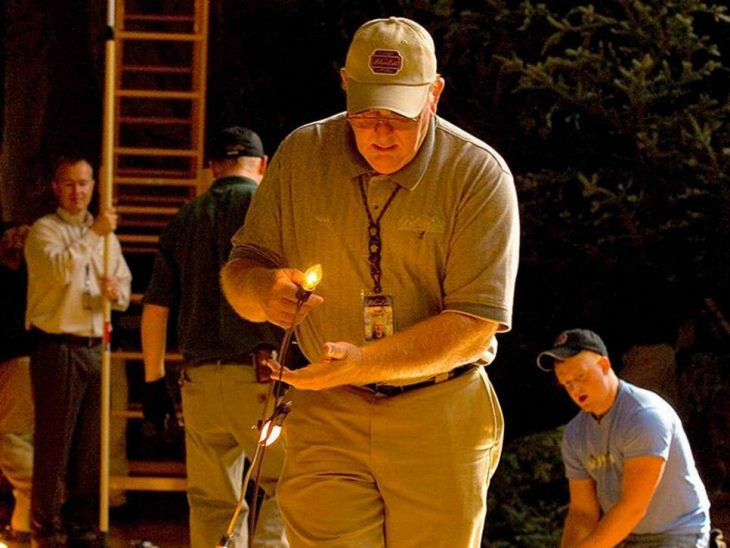 The employees make up about 1,000 of them for inside the house with another 2,000 for around the estate. They use from 5 to 15 yards per bow. That comes to miles of ribbon. 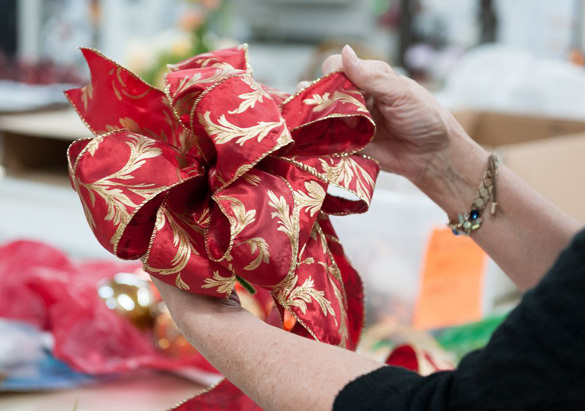 And I thought I used a lot of ribbon! 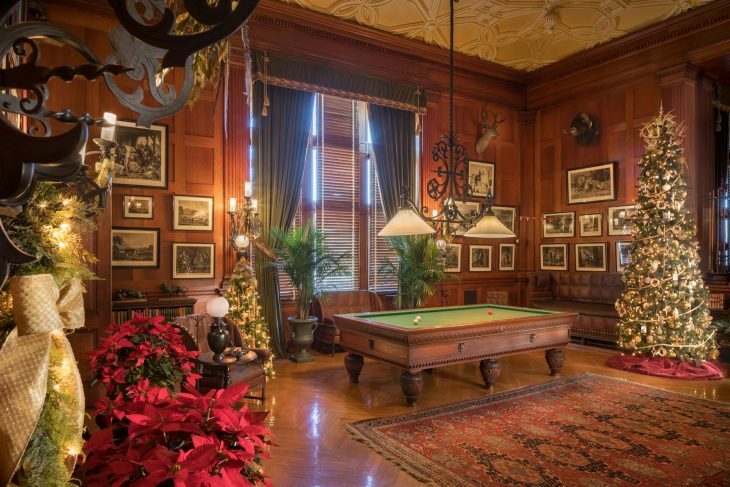 This is the billiard room, near the banquet hall and the winter garden. I wonder how many bets were placed here. Did the women ever get to play? My grandfather taught me how to play, and I would surely have enjoyed a game or two. 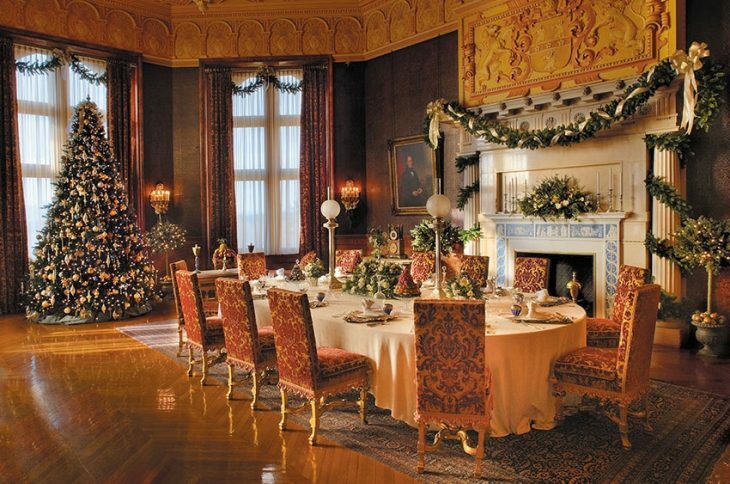 This is the breakfast room, at the back of the house. I love this room. But I will forever be drawn to the library. The magnificent frescos on the ceiling in the library take my breath away. 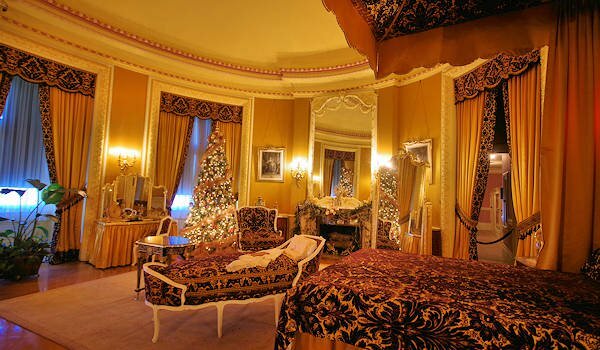 So after the Christmas festivities, Mr. Vanderbilt retired away to his bedroom with seasonal decor. And Mrs. Vanderbilt to hers. 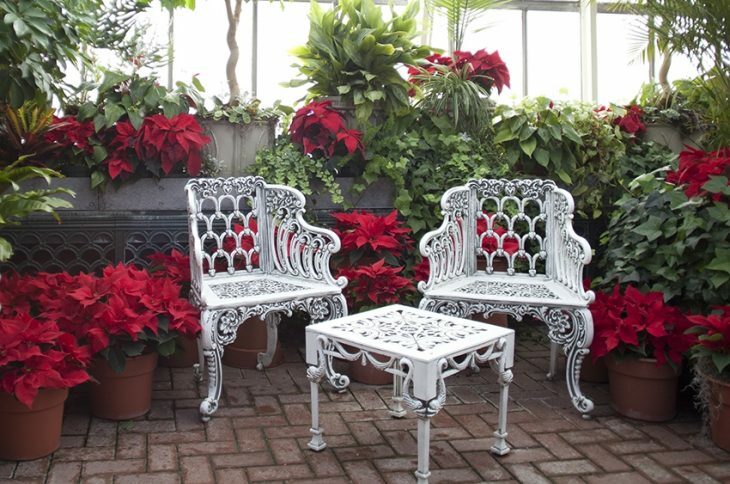 The conservatory is located among the formal garden areas outside. 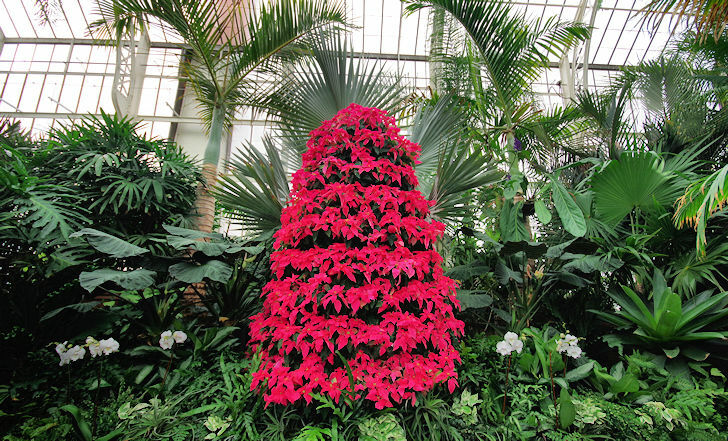 Many come to have their photo taken near the poinsettia trees. 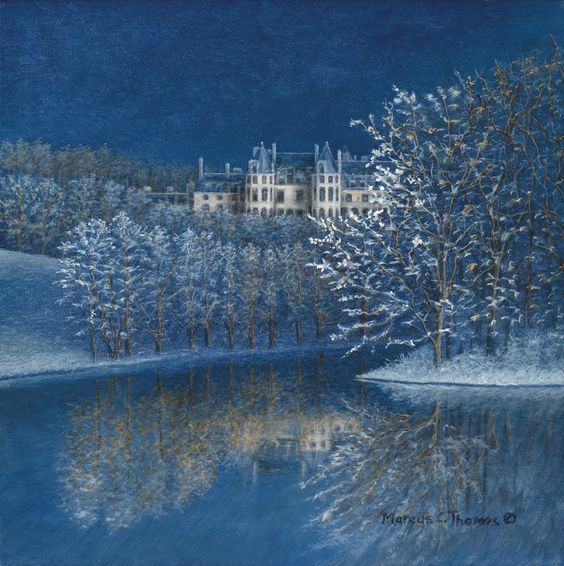 Winter on the estate, which consists of 8000 acres, where snow creates its own holiday spell. There are trails throughout, and you are welcome to walk them on a visit. Even unadorned except by nature, perhaps you can understand why I fell in love with this house and it’s setting. In this photo you can also clearly see where the Winter Garden inside the house is, directly to the right of the front door. 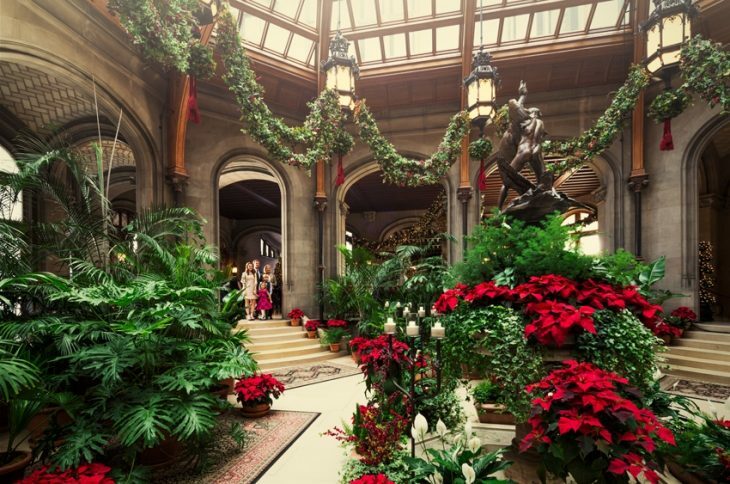 When you first walk in, you cannot help but gasp at the beauty in that room, and especially in winter, it had to just immediately warm you up with the tropical atmosphere. 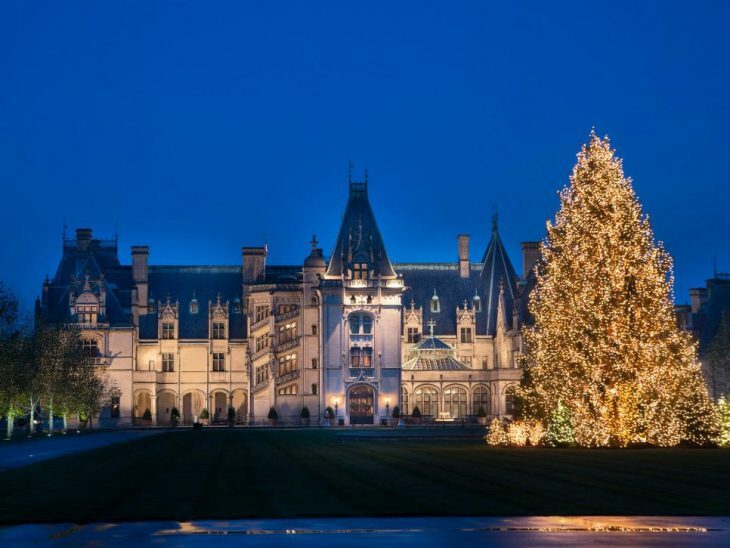 Beautiful Biltmore House in blue. 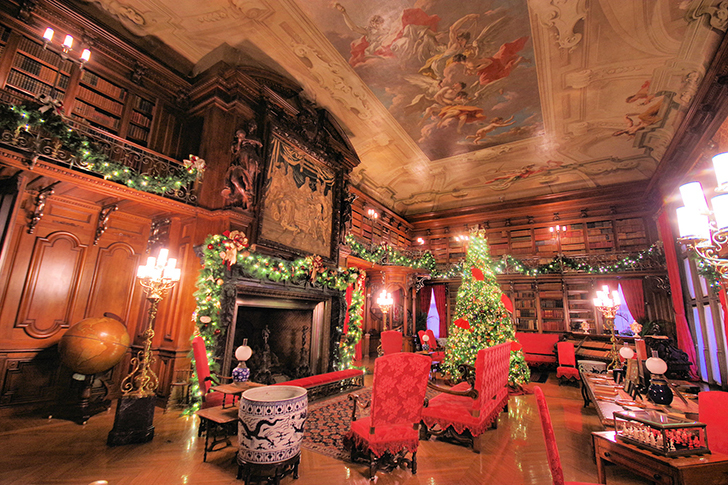 Have you been up to Newport, Rhode Island? 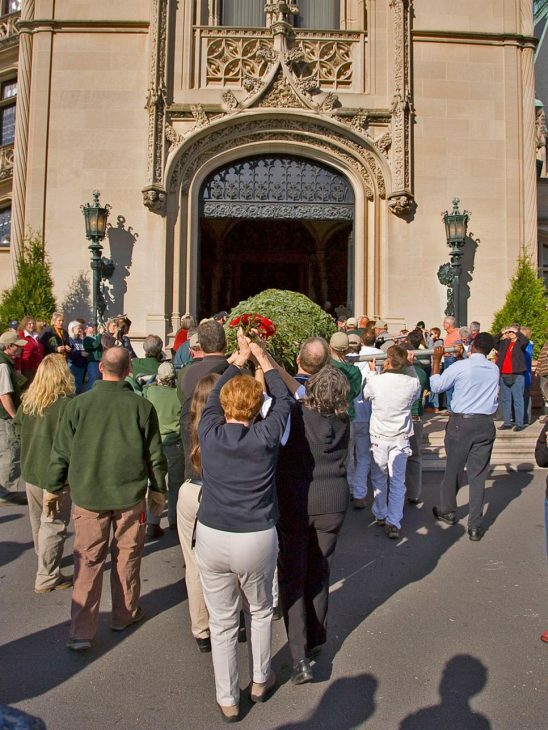 There are a bunch of Vanderbilt Mansions- a really fun trip! 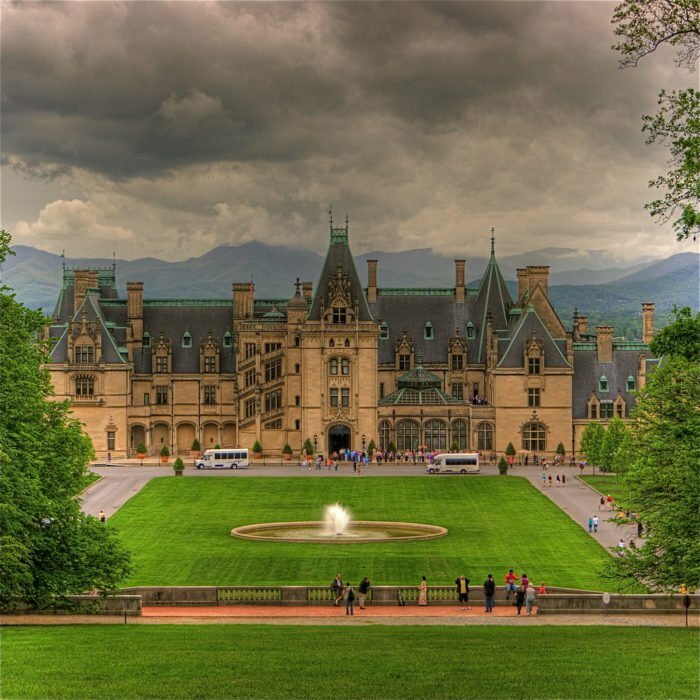 I really really want to make a trip down to Charlotte and Asheville, this post is tempting me more! Hi Arelia. Yes, I have visited Newport several times and visited a couple of the homes. They are something. What a time in our history that was.I hope that you do get to visit Asheville sometime. 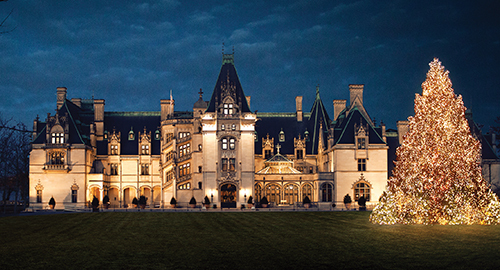 It is a beautiful area, and a visit to Biltmore alone makes it worth the trip. Thanks for commenting. Happy Holidays to you. WONDERFUL research, Charisse! Loved taking the tour through your eyes. Such a special place and setting. When you go here and to the Grove Park Inn, you just cannot imagine how these grand scale works of art were created in the mountains. Oh Charisse! I love this blog! 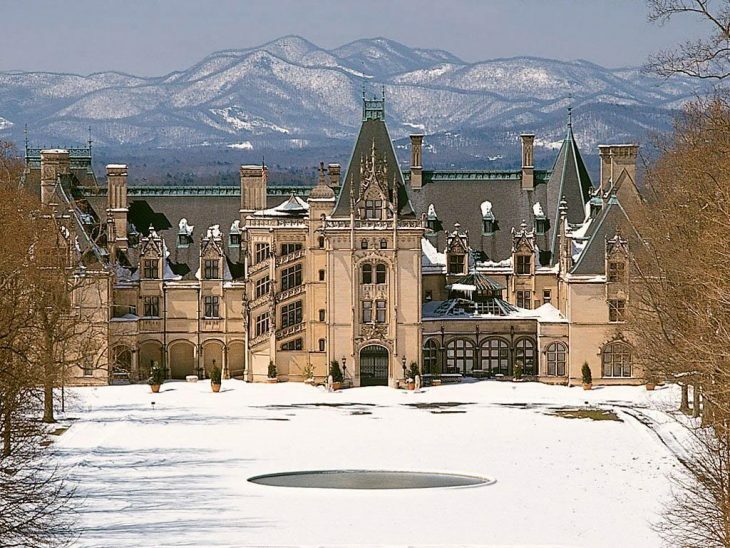 Robert and I moved to Asheville 8 1/2 years ago mainly because of the Biltmore. We have enjoyed it every season for many years. It is a little piece of heaven for us! Your feature is just beautiful. We hope you have a very Merry Christmas! It is so good to read your blogs again! Thank you Victoria. 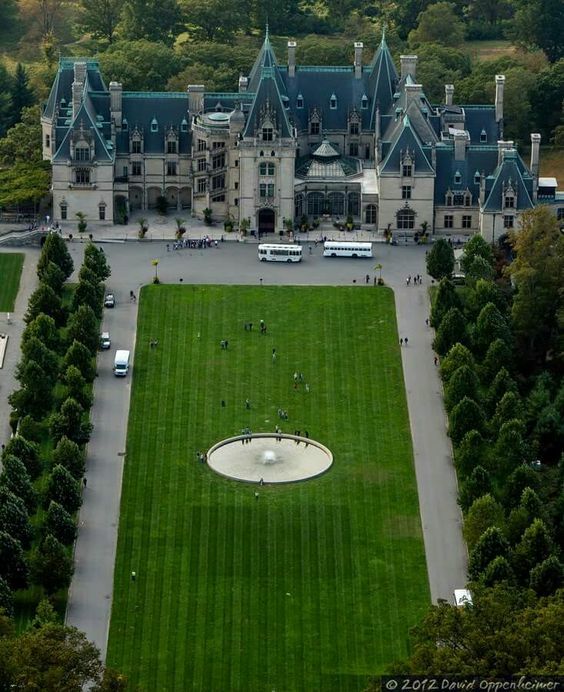 I think Biltmore is an American treasure! 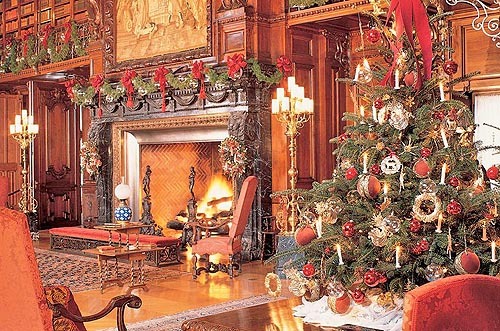 I hope you and Robert enjoy a wonderful holiday and thanks for reading my blog. 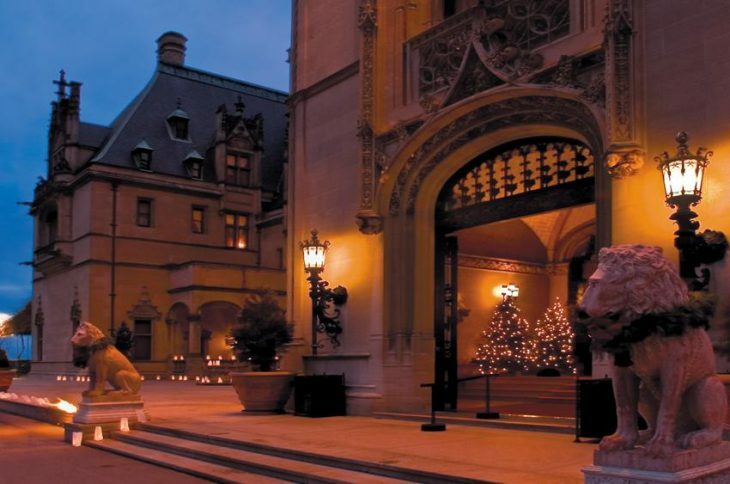 The Biltmore at Christmas is definitely on my bucket list. You took me and Tom there many years ago in the summer. I have always wanted to go back another time. Thanks for sharing this. I remember! 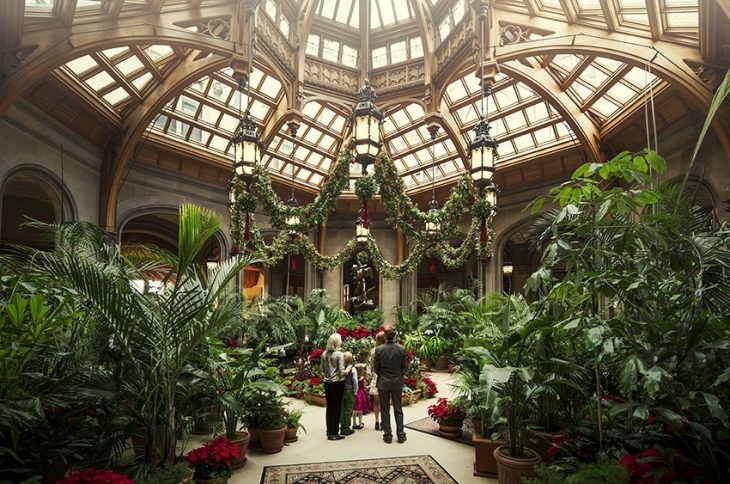 Since then the family has added so much to the Biltmore experience. I really like Asheville, and had it been closer to a major airport (for our work), I think we would have ended up there. We looked at some beautiful land, one on top of a mountain with views I still have not forgotten. Happy Holidays! I wonder whether the family ever goes there to pick a book to read anymore? Happy Holidays to you! Thanks for the tour. 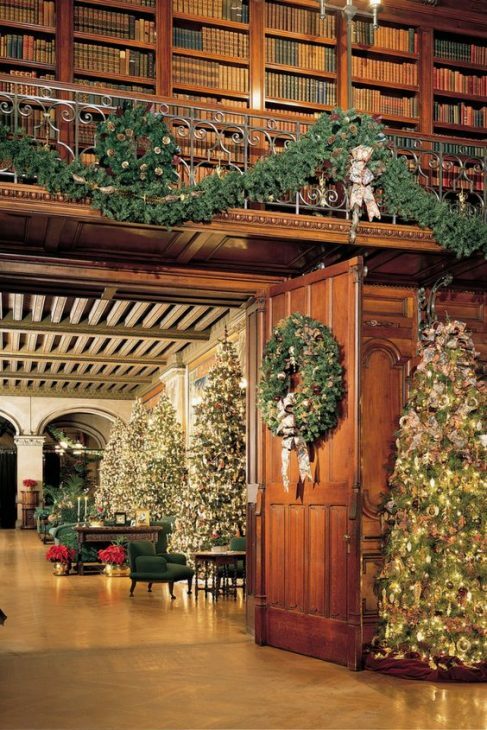 Went to Biltmore many, many years ago and this brought back so many memories. It truly is magnificent . I too love the library!! 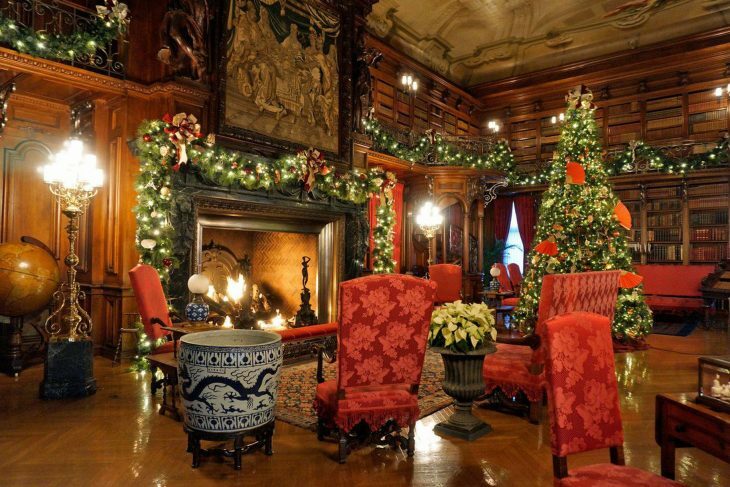 Would love to spend a couple years there perusing the books and enjoying the beautiful fireplace! Happy Holidays!! Looking to Adopt a Pet?